Small shield formed from two pieces from the hide of a young animal, possibly sheep, goat or calf, laid one over the other with the smooth side facing outwards. The long sides are concave, flaring out to a point at each of the four corners; the top and bottom edges are concave on either side of the centre of the shield, where the hide has been pushed outward to form a rounded rib running down its length. This is flanked by large stitches on either side, made from narrow strips of hide, and arranged in eight pairs. These are the lashings that hold the wooden stick and handle on the back of the shield in place. At the centre of the bottom edge of the shield is the tapering end of the inner piece of hide, possibly from the animal's tail; this has been bent over to lay flat against the rib. Both hide surface and stitches are light yellowish brown in colour (Pantone 7407C). The hide is cracking slightly along some edges; there are also some short vertical cut marks on one side, possibly made by a weapon, and some reddish brown stains that look like blood. The back of the shield is rough, with the inner surface of the hide visible. A narrow piece of wood runs down the centre of the length, extending below the base of the shield; the centre of this has been bent outwards, to form a hand grip. This strut serves to strengthen the back of the shield. It changes slightly in form, having a rectangular section at the top end, its upper and lower surfaces becoming more convex at the handle, until it becomes oval in section at the other end. The surface has been polished, and there are shaving marks visible at the bottom end. It is light brown in colour (Pantone 146C). There is a lentoid shaped piece of hide fitted underneath the handle area, probably designed to protect the hand. This is fastened to both shield body and handle by hide thongs near its top and bottom ends; these have been tied around the wooden strut then passed through to the front of the shield and back again to form two of the 'stitches' mentioned earlier. Near the base of this hide piece, a short wooden rod has been fitted between this and the handle, perhaps to provide additional support and allow the handle to retain its shape. There is also a broader piece of hide, with a hole cut into either end, that has been fitted underneath the lentoid piece and around the thong stitching to form a side loop and is probably used to carry or hang up the shield. The rest of the supporting strut has been bound with narrow hide strips, wound once around the body and then plaited to form a raised section down the centre of its length. This binding stops just before the raised handle area, and does not continue beyond the edge of the shield. The strut has been secured to the shield body by further thong stitching interwoven into this hide binding. Near the top of the strut is a single copper ring (Pantone 876C) with rectangular section and pinched, slightly bevelled ends that overlap each other slightly; this has been passed through the thong binding. Near the base of the strut, where it extends beyond the edge of the shield, is a thick, convex sided ring made of reddish brown plant fibre strands (Pantone 7523C), with black ostrich feathers embedded in it. Many of these feathers have probably been lost and several appear to be broken off at their bases. A plant fibre knot is visible at its base, and a single narrow strip of hide has been threaded through near this point; this appears to be broken on at least one end. One further feature may be intended to help the shield body retain its shape: this is a narrow hide strip, pierced by a short cut near either end, then fitted over the projecting corner of the shield, pulled down to form an acute angle, passed through the plaited thong binding for the central strut, then back up at the same angle to the opposite corner. The second part of this strip has been made out of several pieces spliced together. The first of these is now broken at the pierced end; the second may have been intended to replace it - however neither is now attached to the corner of the shield. The lower part of the shield has a similar device, but in this case it seems to be made of thick fibre cord, made of two twisted strands, rather than hide; this has been looped over one corner, passed through the plaited hide strut, then back up to loop over the opposite corner. The hide on the back of the shield has been worn where this cord passes. It seems likely that one of these bindings - either that made from the cord or that made from hide - was made to replace a broken predecessor, using a more readily available material. Total length 626 mm, length of hide body 517 mm, maximum width of body 290 mm; width of handle 18.5 mm, thickness of handle 5.2 mm; width of handle guard piece 72 mm; length of copper ring 55.2 mm, width of copper ring 45.5 mm, and thickness of copper ring 3 mm; width of carrying thong 14 mm; width of supporting cross thong 5.1 mm, width of supporting cross cord 3.3 mm; width of plant fibre ball 51 mm, and thickness of ball 26.8 mm. Obtained by Armine Charles Almroth Wright from the Toposa in the Southern Sudan area and donated to the Pitt Rivers Museum in July 1939. Discussions of the Toposa may be found by Captain G.R. King in L.F. Nalder (ed. ), 1937, A Tribal Survey of the Mongalla Province, pp 65-81 and A.C. Beaton, 1950, "Record of the Toposa Tribe", Sudan Notes and Records XXXI . For the type of spear possibly used with this type of shield, see 1939.7.108. It is possible that the metal ring at the top of the shield could have been added to symbolise a kill. This style of rectangular hide shield is found amongst several other cultural groups in southern Sudan and northern Uganda, including the Turkana, Suk, Didinga, Larim (1979.20.146), Lango and Acholi (1952.5.10? ); see M. Trowell & K.P. Wachsmann, 1953, Tribal Crafts of Uganda, 229-230 and pl. 58.A1-2 and B1-2, and J.H. Driberg, 1923, The Lango, 81-82, both of whom describe how these shields were made. Amongst the Acholi and the Lango, both authors suggest that balls of feathers would be added to the base of the shield prior to battle. Driberg tells us that Lango men usually made their own shields (op.cit., 82). The Acholi and Lango versions tend to be larger than those used by the Toposa, Didinga, Turkana and Larim, who tend to use them as parry shields in close combat (C. Spring, 1993, African Arms and Armour, p. 121 and fig. 116; J. Mack, 1982, "Material Culture and Ethnic Identity in Southeastern Sudan, in J. Mack & P. Robertshaw (eds), Culture History in the Southern Sudan, p. 116 and fig. 2). Currently on display in the Upper Gallery, case 5B, number 138. Accession Book Entry [p. 244] - A.C.A. WRIGHT , ESQ., ... Granville Park, S.E.13. [p. 270] July 1939.7.120 [pencil tick after number] - Hide shield of the TAPOTHA, S.E. SUDAN. (with stabbing spear, [1939.7.]108). Old Pitt Rivers Museum label - [large brown label, front]: Shield Tapotha, S. E. Sudan. A.C.A. Wright July 1939. Fr. 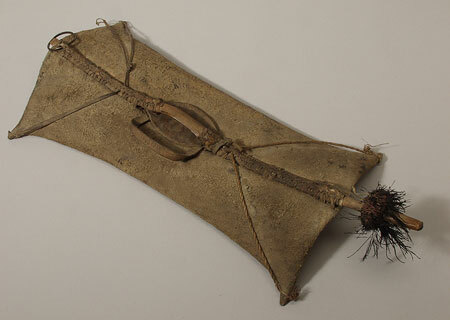 stabbing spear [back] 1939.7.120 [label not kept with object, stored in RDF; RTS 13/1/2004]. Sparks, Rachael. "Toposa shield" Southern Sudan Project (in development). 03 Jan. 2006. Pitt Rivers Museum. <http://southernsudan.prm.ox.ac.uk/details/1939.7.120/>.